10th January 2018 - Esercito.it: NRDC ITA al comando della componente terrestre della NRF 2018. 18th December 2017 - Esercito.it: Al Centro Addestramento Tattico di Brunico si chiude l'esercitazione "livex" "Aquila 7/2017" a favore del NATO Rapid Deployable Corps (NRDC). 6th December 2017 - Esercito.it: Siglato un nuovo accordo di cooperazione con l’Università Cattolica del Sacro Cuore di Milano. 7th November 2017 - Esercito.Difesa.it: Intenso fine settimana di celebrazioni per il “Giorno dell’Unità Nazionale” e “Giornata delle Forze Armate”. 14th July 2017 - Esercito.it: NRDC-ITA incontra "L'Orientale"
28th May 2017 - Il Corriere.it: Al Comando Nato di Solbiate sfilata di bandiere e beneficenza. Festa per il «Corpo di reazione rapida». Incontro di culture diverse e donazione alla pediatria di Busto. 20th March 2017 - Legnano News: Anche la NATO di Solbiate alla Stramilano. 19 March 2017 - Paola Casoli, il Blog: Stramilano: NRDC-ITA vede il 1° Mar Esposto del Restal vincere il Trofeo NRDC-ITA HQ nella mezza maratona. 19 March 2017 - Perseo News: Nrdc-Ita, conclusa la 46esima "Stramilano". 26 September 2016: Difesa: Nrdc-Ita verso la "Summer Tempest 2016"
04 March Ciclo di studi geo-strategici presso il Comando NATO di Solbiate Olona. 10 February "L’Evoluzione della Nato e prospettive future"
21 January 2016 ESERCITO ITALIANO: CAMBIO ALLA SCUOLA DI FANTERIA - IL GENERALE DI DIVISIONE GIOVANNI MANIONE CEDERA' IL COMANDO AL GENERALE DI BRIGATA MASSIMO MINGIARDI. DOPO OLTRE TRE ANNI IL GENERALE DI DIVISIONE GIOANNI MANIONE CEDE IL COMANDO DEL PRESTIGIOSO ISTITUTO. Nrdc-Ita, seminario internazionale "Assessing the crisis on Nato's southern flank"
Italy is a weird nation: we have many centers of excellence that keep the country going, but still most of them are basically unknown to the large Italian public. And so is their top level, high professional performance in whatever field they operate. This is the case for the Nato Rapid Deployable Corps – Italy (NRDC-ITA), one of the nine Nato rapid reaction forces distributed throughout the Alliance boundaries. Based in Solbiate Olona, in the Varese hinterland, the NRDC – ITA Command is currently experiencing a transition from a land component to a Joint Task Force Headquarters (JTFHQ), according to the Nato defense restructuring that requires an increase of responsibility by the HQs at operational level, in order to address the contemporary challenges of high intensity, asymmetric and hybrid warfare. These sound like technical requirements, but they will make a difference when Nato forces will be deployed again for both article 5 and non-article 5 missions. The NRDC-ITA Command, under the leadership of Lt. General Riccardo Marchiò, has successfully completed Exercise Trident Jaguar 2015, the final stage that marks the passage to a joint command in which all the defense components – air, land and sea – are present. Trident Jaguar 2015, a computer assisted exercise, took place at the Joint Warfare Center in Stavanger, Norway, from April 15 to April 28, 2015. Italy is the second country to obtain the Nato certification, the so-called Full Operational Capability: Spain was the first last year to be engaged in a Trident Jaguar training. Still, Italy can proudly show off many new features that are increasing efficiency, efficacy and adaptability to dynamic, fast-changing scenarios. Just to mention a few: the dual tactic-operational role, which is the core of an integrated system; the involvement of civil analysts (on economic, political and social issues) next to the military ones; the so-called “influence” pillar that combines military and non military elements in a crisis response operations where kinetic actions interact with non kinetic aspects and with non-military actors (GOs, NGOs, IOs) who are increasingly impacting on the course of the events. NRDC-ITA is also the first to have understood the importance of setting up a new concept of Security Assistance Force (SFA), the core of Nato missions. Of course, it can count on an extensive experience drawn from three deployments in Afghanistan (2006, 2009, and 2013), which somehow supersedes the lack of a specific doctrine. 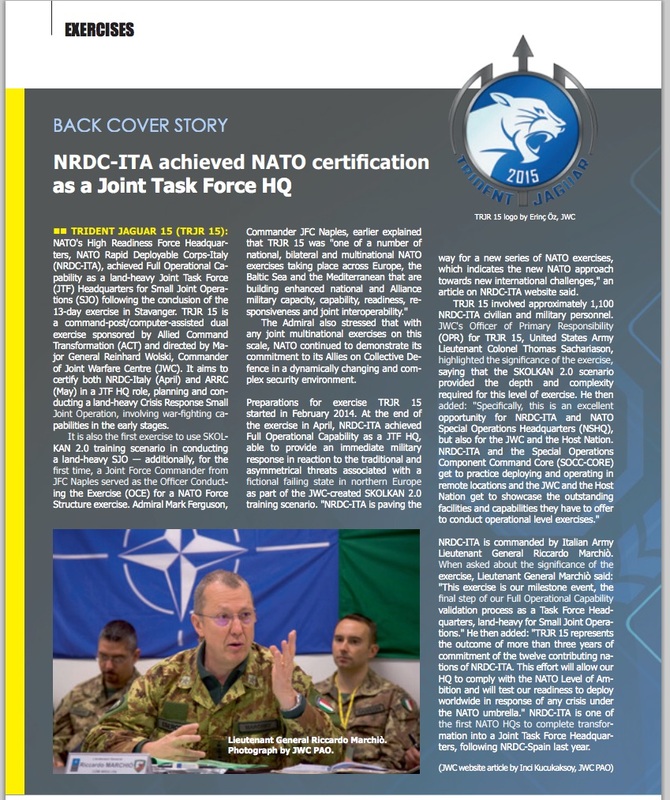 By relying on general Nato and national guidelines, and on theater of operations’ outcomes, NRDC-ITA has shaped SFA activities in a well structured system that in addition to training and assistance provides advising from tactical units up to a Ministry of Defense representatives. Advising implies a follow up of all SFA activities, the identification of possible gaps, a problem-solving approach and eventually influencing behavioral attitudes and mindset. To this respect, Trident Jaguar 2015, which is coming to an end in a couple of days, is a success story. NRDC-ITA has been praised by the Joint Warfare Command, Major General Wolski, and by other foreign top military officers during the Distinguished Visitors Day. It would have been nice to see someone from an Italian defense joint command as well, it would have shown that the Italian Defense is aware, like their foreign counterparts, that there are military professional competences that make us proud to be Italian. NAPLES, Italy – North Atlantic Treaty Organization forces will conduct Exercise TRIDENT JAGUAR 15 during April and May 2015. The NATO Rapid Deployment Corps - Italy (NRDC-ITA) from 20 – 27 April 2015 and the Allied Rapid Reaction Corps (ARRC) from 8 – 15 May 2015 are conducting a major NATO Command Post Exercise (CPX) at the Joint Warfare Centre Stavanger, Norway. The exercise is focused on synchronized actions among joint force headquarters’ staffs. It is a large scale command post scenario that will test the staffs’ abilities to coordinate resources, synchronize assets, disseminate information, develop courses of action and provide recommendations to commanders. The Commander also stressed that with any joint multinational exercises on this scale, NATO visibly demonstrates its commitment to its Allies on collective defence in a dynamically changing and complex security environment. A Command Post Exercise (CPX) is a computer assisted simulation with no live fire or maneuver exercises associated. The concept of a CPX is to test and evaluate the abilities of the Command Posts’ battle staffs to establish and execute command, control, communications and computer capabilities, while integrating various joint warfighting and civilian agency functions. The international political changes of the past few years spurred the Atlantic Alliance to rethink its own military capabilities in order to be able to address new threats to the member nations’ security, starting with the rapid reaction forces that experienced a significant development over the years and that today count nine rapid deployable corps commands inside NATO boundaries. The new Strategic Concept adopted during the Lisbon Summit of 2010 laid out the guidelines for the Alliance Defense and its restructuring, which inevitably impacted on the Rapid Deployable Corps: they are currently under a transition process that will mark a passage from a Land Command into a Joint Task Force Headquarters (JTFHQ), integrating the air force and navy components. As one of the so called “framework nations” of the Alliance’s army corps commands - the NATO Rapid Deployable Corps Italy (NRDC-ITA) – Italy is indeed involved in this transition and, compared to other host countries, it is among the first to complete its transformation. In these days NRDC-ITA is, in fact, engaged in the Trident Jaguar 2015 (TRJR 15) exercise at the Joint Warfare Center (JWC) in Stavanger, Norway. At the end of the exercise, it will reach the NATO Full Operational Capability (FOC) and the status of JTFHQ. Spain has been the first, last year, to achieve the FOC and now NRDC-ITA is the second command to wind up the upgrade according to the guidelines of the 2010 Strategic Concept. Why is this upgrade so important? First and foremost it implies the acquisition of the operational C2 capability, in addition to the tactical one: the management of complex, asymmetric and hybrid scenarios where military activities interact, coexist, and are influenced by non military aspects. A complex scenario is exactly what NRDC-ITA is coping with in Stavanger. TRJR 15 is a simulation, a computer-assisted exercise, of a hypothetical Skolkan region where the State of Arnland is experiencing a serious political crisis. Turmoil is endangering the whole area and the situation is getting worse due to the presence of a radical terrorist group and of several external actors who are attempting to influence the course of action by hampering a negotiated peaceful solution to the crisis. This is the scenario that prompts the Northern Atlantic Council to approve a security assistance mission called ASAF (Arnland Security Assistance Force) led by NRDC-ITA, which is supposed to have been deployed in Arnland for 100 days at the beginning of the exercise. By supporting the Arnish security forces NRDC -ITA must react to a number of the so-called injections, that is, incidents, attacks or other destabilizing events. The mission goal is to assist the legitimate government in its effort to restore normal security conditions before the general political elections take place. TRJR 15 is conducted inside the Joint Warfare Center compound. Standing in the lee of a hill, in 1950 the JWC inherited a World War II German bunker located inside the hilltop: when the Norwegian military authorities took over, the bunker was restructured in order to resist to a nuclear attack. The core management element of the exercise is the “ExCon” (Exercise Control), which is placed inside the bunker: ExCon generates and coordinates all the injections that require an action or reaction by NRDC-ITA. More than 500 trainers and evaluators are involved in Trident Jaguar; their task is to engage all the NRDC-ITA branches and all the joint components, eventually assessing their response capabilities. A considerable amount of time was devoted to the planning and organization of TRJR 15: it took approximately 15 months to lay down the first general ideas, to develop them into a detailed scenario, and to manage all the demanding organizational aspects. Inside NRDC-ITA there is a hectic, almost feverish, activity: everybody works at a fast pace. Coordination, teamwork and determination are the main elements of this restless effort carried out by the entire staff, including the Italian Commander, LT. General Riccardo Marchiò. In a word: professional competence. A strong commitment that impressed the Stavanger NATO center. 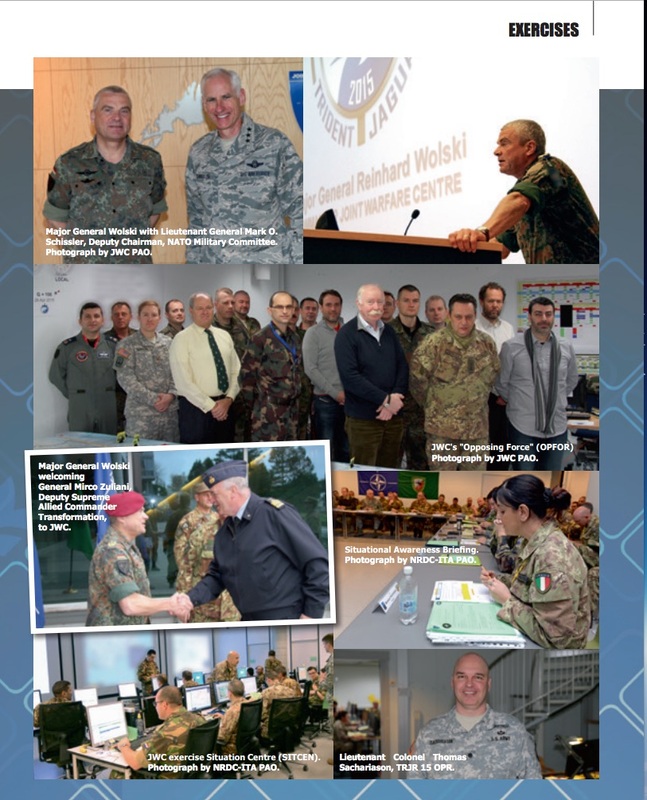 “The training audience of NRDC-ITA came in very well prepared, it’s one of the best prepared training audiences I ever had” said the JWC Commander, Major General Reinhard Wolski. “They perform very, very well indeed. We have seen that this core has prepared itself for one year. I am very satisfied; the command is interacting with the staff, that’s very professional indeed. So I must say it’s really good”, he concluded. No wonder: NRDC-ITA is a top level, highly effective military structure with extensive on-the-ground experience, having been deployed three times in Afghanistan in 2006, 2009 and 2013: a strong professional background in non-article 5 scenarios, even though – until now - at a tactical level. Several new crucial elements introduced by the NRDC-ITA command in its passage to JTFHQ make it a unique military structure. First of all, the double role: while assuming joint command and control capabilities, NRDC-ITA has retained its tactical functions as well; secondly, a new, more systematic and organized approach to the Security Assistance Force (SFA) function with the introduction of a third “influence” pillar (the other two being operations and support), which helps manage the combination of non kinetic aspects with military operations, according to the NATO comprehensive approach; finally, for the first time – and upon the request of NRDC-ITA - some embedded Italian journalists have been admitted to a NATO exercise with the dual role of journalists in real life, reporting to the Italian audience, and of media actors inside the Skolkan scenario, that is, journalists embedded with the ASAF contingent. This is a true innovation that adds to transparency in real life and to a close-to-reality contemporary scenario: no player is ruled out in a complex environment: Just like it happens in any area of operations where NATO troops are deployed.